The three G4S guards who restrained Mr Jimmy Mubenga are on trial charged with manslaughter following his death on board a British Airways flight in October 2010. The trial is entering its third week and is expected to run for another seven weeks. In supporting his family, we call on people of colour and all those interested in seeing justice done to fill the public gallery to bear witness to the horror committed against Mr Mubenga and to witness how the prosecution does its work. This is only the second time we know of when a death during a deportation has resulted in a trial. The last time was when three police officers were found not guilty for the death of Joy Gardner, a 40-year-old mother who died after she was forcibly restrained with a leather belt, manacles and yards of surgical tape. Women of Colour Global Women Strike and the All African Women’s Group have been attending since the trial started. Other groups and individuals are also coming regularly. Ayo Omotade, who verbally intervened to stop a violent deportation in 2008, and was arrested and prosecuted as a result, has attended the trial and spoken in support of the family. Please join us and let family, friends and your networks know. We want to demonstrate that many people value Jimmy Mubenga’s life, and believe that all our lives matter. See BBC and The Guardian reports of what happened in court. · Attend the trial, and let your networks know about it. · Sign & circulate the petition supporting the family’s efforts to get justice, including proper compensation, and for G4S to face corporate manslaughter charges. 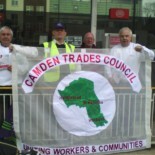 This entry was posted on November 17, 2014 by CAMDEN TRADES COUNCIL.